You can get the best of journalism on your iPad. People in the newspaper business know that it’s been tough sledding in recent years. The Internet has proved to be a disruptive force in media, as it has in so many areas. It remains to be seen what role Apple generally, and the iPad specifically, will play in the future of electronic periodicals or in helping to turn around sagging media enterprises. It’s also uncertain which pricing models will make the most sense from a business perspective. Reading newspapers and magazines on the iPad is not like reading newspapers and magazines in any other electronic form. The experience is slick, but only you can decide whether it’s worth paying the tab (in the cases where you do have to pay). You can subscribe to or read a single issue of a newspaper or magazine on the iPad. There are several fine publishing apps worth checking out, including USA TODAY (where Ed works), The Wall Street Journal, TIME magazine, The New York Times, The New Yorker, Reuters News Pro, BBC News, Vanity Fair, and Popular Science. Sometimes you can read for free; sometimes you must play for your subscription. You can also fetch the free Zinio app, which offers more than 6,000 digital publications, including Rolling Stone, The Economist, Consumer Reports, Forbes, Macworld, Car and Driver, Maxim, National Geographic Interactive, Spin, and Bloomberg Businessweek. You can buy single issues of a magazine or subscribe, and you can sample and share some articles without a subscription. Meantime, if you like to read stuff from particular blogs or sites, consider the free Feedly news-gathering app, which you can fetch from the App Store. The freshest path to reading publications on your iPad is through the News app added with iOS 9 and reimagined in iOS 10. News essentially displaces the Newsstand folder that was once available on your Home screen as a gathering place for your newspaper and magazine subscriptions. News, however, is an app — not a special folder like Newsstand. It sports content from a gaggle of online and offline content producers, including some of the big name publishers. 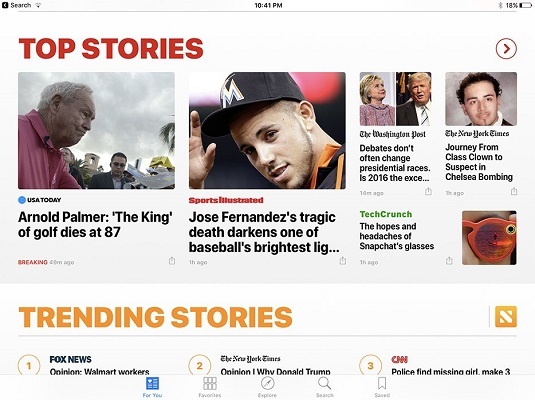 When you get started with the News app, you can choose the news sources and topics that you’d like to follow. Apple says you can choose from more than 1 million topics. Many of the world’s leading informational sources contribute to News. After making your initial content selections, you’ll receive a smorgasbord of news stories that are presumably of interest, all delivered in a handsome layout that is loosely reminiscent of Flipboard, a great third-party app. You can sign up for notifications and have news delivered to your inbox. Apple promises to refine the content it is sending your way as it gets to know your reading preferences over time. In the meantime, you can search for content as well as share stuff you read, by tapping the now familiar share icon and choosing among a variety of sharing options. However you choose to read on your iPad — through iBooks, electronic periodicals, or the News app — your experience is likely to be rich, informative, and pleasurable.